In the mid 1800’s Metis fur traders were pushing west into the area of present day northern Saskatchewan. They hunted buffalo and traded with the Cree natives during the summer months but would return to more hospitable lands to wait out the winter. Eventually, some of the Metis began to take up year round residence at a bend in the South Saskatchewan River that they called Batoche. Here they made farms and started a town. In the summer of 1884 land surveyors from the Canadian government appeared in the area. They were preparing the way for the settlers that would be coming on the new Canadian Pacific Railway. The Meti spoke French but the surveyors were English. The Meti had established their farms in the traditional French style that drew property lines based upon the river. The surveyors used a system that took the whole territory into account and was based upon the railroad line. When the surveyors appeared on Metis farms and started drawing lines down the middle of them, the stage was set for trouble. Some of the Metis had come from the Red River Settlement in Manitoba where fifteen years earlier the same thing had happened. There the government surveyors had come and redrawn the boundaries. They told Metis squatters that the farms they had been working did not belong to them. That was why they had moved west. Now it looked like the same thing was about to happen again. The Metis would not allow it. They wrote letters to Ottawa and they sent a delegation to Montana to fetch the exiled Meti leader Louis Riel. In 1870 Louis Riel had led the Red River uprising. He and his men seized Fort Garry and proclaimed their independence. The Canadian government mobilized the army to put down the uprising. Before the government troops arrived Riel and the other leaders fled across the border into the United States. Now he returned to Canada to help the Metis at Batoche. Riel was not a military leader. He was a spiritual leader and a great orator. The Metis chose Gabriel Dumont as their general. When Ottawa ignored their letters the Metis chose a more drastic approach. They captured the store at Duck Lake and on the 26th of March 1885 the North West Mounted Police came to expel them. In the process two Police Officers and eleven volunteers were killed. The winter of 1884-1885 was a harsh one. The Cree natives living in the area came into the town of Battleford asking for blankets. When the townspeople refused, Chief Poundmaker and most of his people left but some warriors stayed behind. They attacked the town and looted some buildings. The Cree did not really support the Meti rebellion but they took the opportunity to pursue their own goals. In Ottawa the politicians hit the roof. It looked like the whole west was on the verge of rebellion. Sir John A. MacDonald’s plan to secure the west with the Canadian Pacific Railway was supposed to protect us from the threat of American expansionism. Now the west was in danger of being lost to Meti and natives. Ottawa mobilized the army. Militia soldiers from all across Canada answered the call to arms. The head of the CPR, W.C. Van Horne, promised Prime Minister MacDonald that he would transport all of the troops to Saskatchewan on the condition that he was allowed to do all the planning without interference from the army staff. All day Saturday and Sunday the troops were outfitted and stores made ready for shipment. On Monday morning two special trains were loaded at Union Station. The first contained Lieutenant-Colonel Otter and his staff, C Company of the Infantry School Corps, and the Queen’s Own Rifles. The 10th Royal Grenadiers followed on the second train. At noon on the 30th of March these trains pulled slowly out of Toronto. Once clear of the city, twenty-three Queen’s Own stowaways appeared. They were allowed to stay. The trip to the West was, for many, the hardest part of the campaign. The CPR line was not complete. There were four major gaps along the north side of Lake Superior. At some of these gaps the CPR had sleighs to carry the men and equipment but at others the men were required to march across the frozen lake. Even in areas where there was track the men suffered. There were not enough passenger cars, so open flat cars were used to transport the men through the frozen night. Eventually they made it to Port Arthur where passenger cars were waiting. From there the run to Qu’ Appelle Station was uneventful. General Middleton’s plan was to advance with three columns. The first was to march on Batoche from Qu’ Appelle with Middleton in command. The second, under Lieutenant-Colonel Otter, would take the train to Swift Current and then march north to relieve Battleford. The third, commanded by Major-General Strange, was made up of the Alberta Feild Force who were already in Calgary and they were to march to Edmonton. This would place all three columns on the North Saskatchewan River. They could use the river to link up again and deal with any other problems in the area. The column reached Swift Current on April 11th. The next day they began the 208-mile march north to Battleford. Winter was still in full effect and the troops suffered through snow, sleet, rain and winds. Their meals were eaten cold because there was no wood available for cooking. Eventually, late on April 22, wagon teams arrived with wood, so the men had a hot breakfast the next day. The column reached Battleford on the 24th to find 530 people crowded into the fort that was only 200 yards square. The Cree left Battleford before the column arrived. They made no attempt to pillage or burn the town. The soldiers began building earth works around Government House a large building on the south side of the Battle River. They christened this Fort Otter. Having learned on the 20th ult. from my scouts, that of force of Cree and Stony Indians, numbering about 200 men, were encamped near the reserve of the former tribe, some thirty-eight miles from here, and subsequently that Poundmaker, the Cree chief, was hesitating between peace and war, the latter eventually depending upon his being able to obtain assistance from Big Bear’s tribe, I felt it necessary that definite action should be taken in order to make Poundmaker declare himself, and prevent a junction of the forces of the two chiefs. I determined on a reconnaissance in force. The idea that a force of over 300 men could sneak up on a group of Indians on their own reservation seems strange, but that was his plan. At 4 a.m. on Friday May 1st, a flying column left Battleford four Cut Knife. They arrived at daybreak on May 2nd. Hardly had our scouts gained in the crest of the hill when the advanced part of the enemy was met, who opened fire upon our men with vigor. The Police immediately extended on the low brow, and the guns supported by B Battery (garrison division) were pushed forward into the same line, opening fire with shrapnel on the camp. The disposition of our force was as follows: – in the center of the front line, and just behind the brow of the hill, was the Gatling, flanked on either side by a seven-pounder brass gun, all under the personal supervision of Major Short, ably assisted by Captian Rutherford. The support of these guns consisted of the garrison division of B Battery. Immediately to the rear, resting in a slight declivity, were the horses of the Police and the waggon train. On either flank of the artillery were the Police. To the right and right rear was C Company and the detachment of the Guards (Ottawa Sharpshooters). To the left, lying on the lower ledge of the hill, and extending nearly to the Creek, was the Queens Own; and protecting the right rear and ford was the company of Battleford Rifles. The positions thus described were, with some slight changes, retained by the corps more or less throughout the action. The right rear, which took in the ford, was menaced, and a part of the Battleford Rifles, under Captain Nash, assisted by individual men of C Company, Guards, and Q.O.R., with Constable Ross, (Chief Scout) of the Police, undertook to clear the coulee at that point. This they did most effectually, capturing four ponies whose riders were shot by them. A similar duty had now to be performed on our left rear, which was entrusted to parties of the Queens Own and Battleford Rifles, and proved one of the sharpest brushes of the day. Lieutenant Brock, Q.O.R., most pluckily led the party to clear our left rear, and Sergeant McKell and privates Acheson and Lloyd, of the same corps, distinguish themselves by assisting the wounded to places of safety in the face of a heavy fire, private Lloyd himself being wounded in this duty. The ambulance corps of the Queens Own was particularly prominent in answering the numerous calls from the front for assistance, many times having to traverse ground that was raked by the enemy’s fire. Brigade-Surgeon Strange, I.S.C., and Surgeon Lesslie, Q.O.R., rendered willing and valuable assistance to the wounded, both on the field and in the temporary hospital that was established in the waggon laager. At eleven o’clock, that is, six hours after the beginning of the engagement, our flank and rear were clear, but the position we occupied was not tenable over night, while both guns were practically useless through broken trails, and the wounded required proper attention. Further, the object of the reconnaissance had been accomplished, in as much as Poundmaker had declared his intentions. But Big Bear, or at least his men, had affected a junction before my arrival, as the number of the enemy was fully five hundred fighting men, including some fifty half-breeds. I therefore concluded to withdraw and return at once to Battleford in case a counter-attack might be made on that place. Bugler H. Foulkes C. Co. I.S.C. Sgt Jas. T. Gaffney B. Battery R.C.A. Corp. T. Morton B. Battery R.C.A. Gunner T. Reynolds B. Battery R.C.A. Sgt. Maj. A.J. Spackman C. Co. I.S.C. Chief Poundmaker finally came in to Battleford and surrendered to Captain P. D. Hughes and Lieutenant R.S. Cassels on May 26th [see Cassels’ 1885 NW Field Force Diary]. By this time General Middleton and his column had arrived in Battleford. They had fought actions at Fish Creek and Batoche. After a brief rest in Battleford they continued on to Fort Pitt to meet up with Maj-Gen Strange and to pursue Big Bear. The rest of the campaign, for the Battleford Column, consisted mainly of local protection in the Battleford area. A major reconnaissance to the area of Turtle Lake took place from June 8th to July 1st. Its purpose was to capture Big Bear and his men. They were unsuccessful and the reconnaissance turned out to be something of a camping trip through the beautiful northern Saskatchewan countryside punctuated by unpredictable outbursts of weather. Chief Big Bear surrendered to the NWMP at Fort Carlton on July 2nd, ending the campaign. On July 5th the Queen’s Own started for home. They traveled by steamer to Grande Rapids and then by train to Winnipeg. They stayed in Winnipeg From the 15th to the 19th of July and then proceeded to Port Arthur where they boarded a steamer that carried them to Owen Sound. From there they went by train to the North Toronto station, arriving late in the afternoon of Thursday, July 23rd. They marched through the city to a tremendous “Welcome Home” from the citizens. I am seeking information on a William A Fisher. The information that I have: Born 1840 in Guelph, Ontario. Died Selkirk Manitoba, 1885. Married to Sarah Bolton also of Quelph. The accuracy of the information from an elderly relative, is in question. Beause of the date of death, he may have taken part in the Riel rebellion; on either side. Dear sir or madam , I am trying to find out about my late grandfather Ernest Joseph Camies . 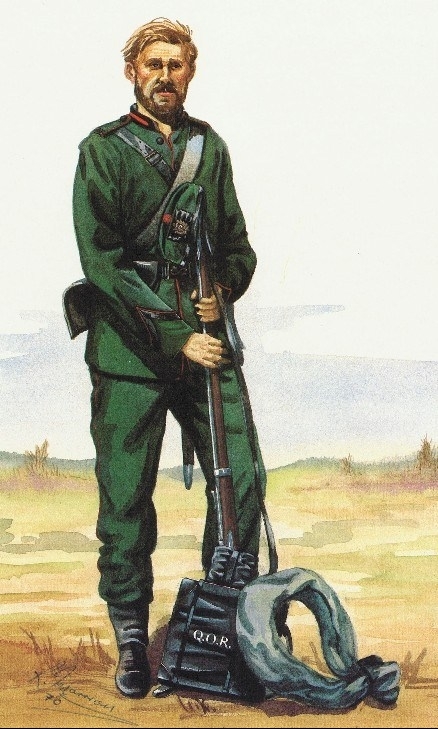 Who served in The Queens Own Rifles , in the riel rebellion of 1885 . I have in my possession the miniture medal with clasp . Would you have any information on him on your records , files etc . ? If so would it be at all possible to have any information on him . I am at present writing a book on his life . Yours sincerely Laurence Winfield. Mr Winfield – We checked our database and didn’t find any references to your grandfather. It is possible we might have references but if they have not been entered into the database yet, we obviously have no way to know.